What is the point of a service trip? Service trips allow us to dedicate a week of our lives to serving others. During a week of service, our eyes can be opened to new experiences, as we intentionally walk in the footsteps of Christ and share in His mission to serve the poor. What if I’m not religious? Can I still go on a service trip? Yes! Our service trips are open to everyone! Why do I have to pay to do service? The registration fee covers the cost of transportation (rental car fees, gas, and insurance), food, and housing. We drive to all of our service trip destinations. Longer trips = longer time in a car. We use rental vehicles or vehicles provided by student volunteer drivers. Your spot is not confirmed until you have paid. After you register online, you may pay using cash, check, or Venmo (@UWBadgerCatholic). What if I can’t afford to pay? Are there scholarships available? We offer scholarships to those with financial need. Please email serviceteam@badgercatholic.org to apply for a scholarship. We want everyone to be able to experience a service trip, so please reach out to us if you have any financial concerns! Why do I need to provide my health insurance card? We need your health insurance card in case there is an emergency. No worries, we keep everyone’s personal information strictly confidential. Spend your Spring Break in warm and sunny Charleston, South Carolina! 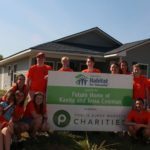 Join Badger Catholic in building houses with Habitat for Humanity from March 16th to the 22nd. You don’t want to miss this great opportunity to make awesome friends while helping those in need! Register below.